Put oil & 1tbsp ghee in a pressure cooker. Add Cardamom, Cinnamon & clove fry..
Add onion & green chilly saute till it gets golden brown. Add carrot & beans salt-1tsp, fry for 5min. Add ghee, ginger-garlic paste & fry for 1-2 minutes. Add rice & fry for 2min. Add water & salt mix well. Close the lid (whistle it 3times). Let the cooker cool by itself. Congrats on your Awards Madhura! May you have many more in future! Rice looks delicious.. i liked the bowl too. 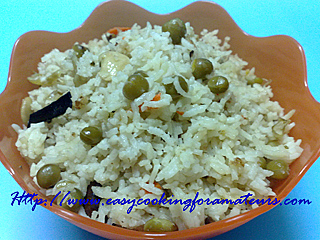 Love making rice with green peas too. This looks very healthy and yummy at the same time. Yummyilicious peas and ghee rice, looks fabulous..
first time here..great recipes and lovely space..rice looks delicious and tasty!! hey madhura...thanks for stopping at my blog and for wonderful comments...lovely space here too !! What a lovely rice recipe! Looks so healthy too! Yum!